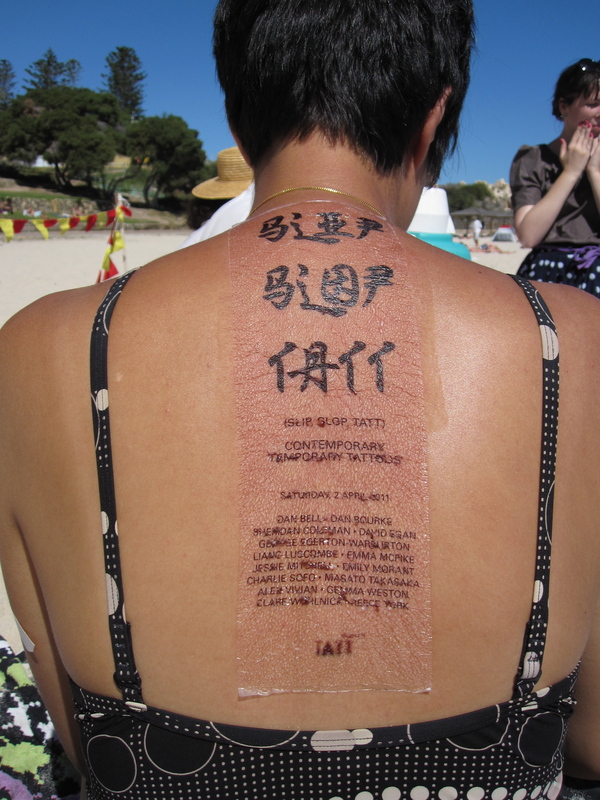 Slip Slap Tatt, an exhibition of temporary tattoos at Perth’s Cottesloe Beach was put on as a dig at Sculpture By The Sea, the annual public sculpture event. Dan and I thought that be our exhibition could latch on to Sculpture By The Sea’s overblown publicity as an undercover exhibition. However, due to our lack of interest in Sculpture By The Sea, Slip Slop Tatt actually took place the week after the closing of the public sculpture monster event. 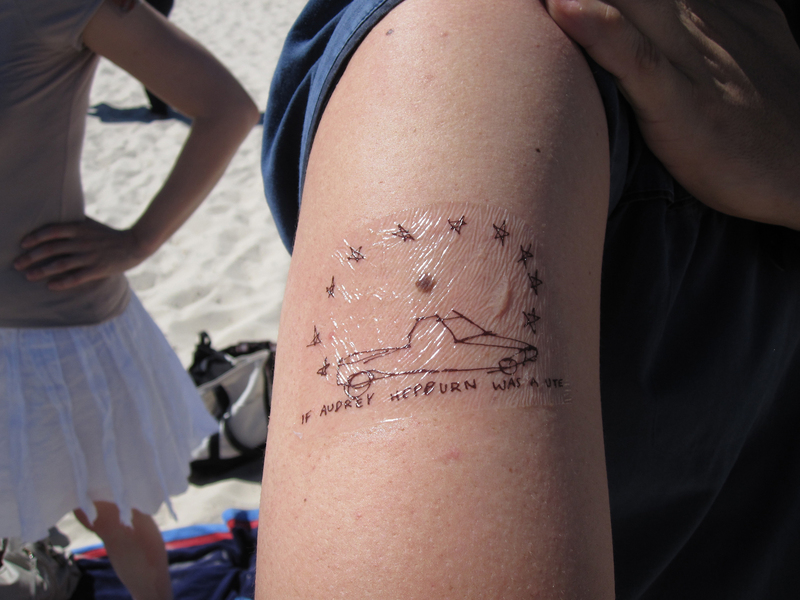 Instead, our show melted into the tattoo wearing, beach goers that descended on Cottesloe every day. 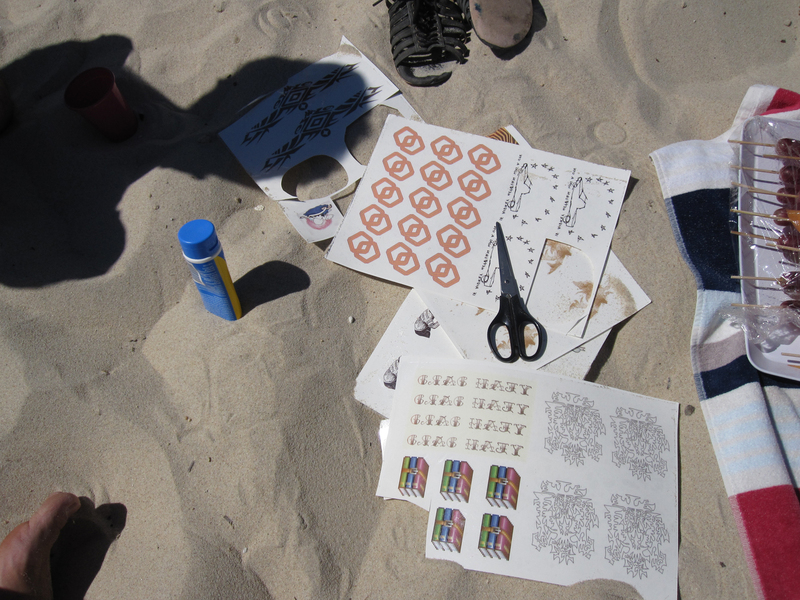 We set ourselves up at the beach with some flags, punch and invited others to make selections from the temporary tattoos designed by the fifteen Melbourne and Perth artists. People came and went and seemed to be quite enthusiastic about the prospect of covering themselves in tatts; tramp stamps, fake pubic hair and tatts on guns were big hits. Temporary tattoos placed next to or on top of permanent tattoos were particularly good with the tattoo designs that resembled commonly seen tattoos especially popular among the wearers. 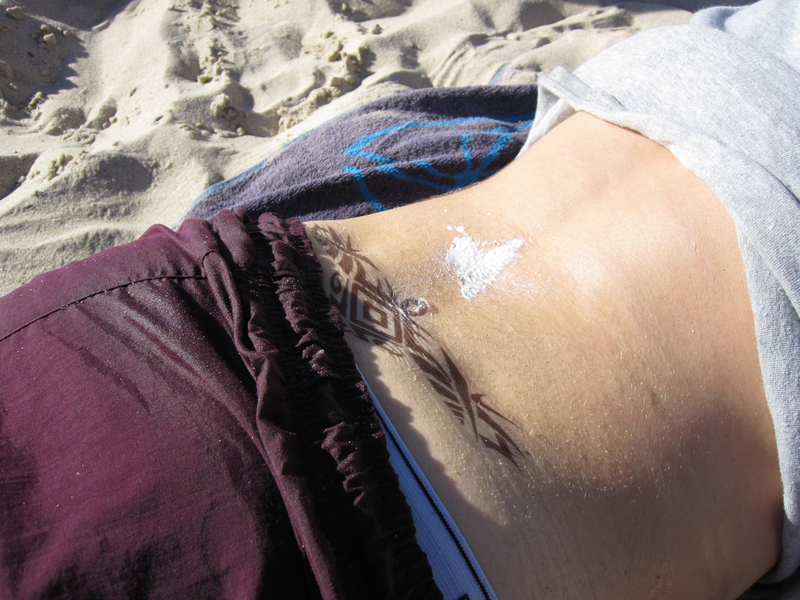 Our models then hit the waves and sand showing off their new tatts. Cottesloe Beach, Perth, Western Australia on 2nd April 2011. Artists: Dan Bell, Charlie Sofo, George Egerton-Warburton, Liang Luscombe, Dan Bourke, Alex Vivian, Masato Takasaka, Clare Wohlnick, David Egan, Sheridan Coleman, Emma McPike, Emily Morant, Jessie Mitchell, Reece York.